"I'll do it when I am damn good and ready!" A very useful set of phrases for finding out why I am (or anyone else is) procrastinating. I don't want to make that phone call! I really don't! I hate telephone trees and waiting and listening to loud, obnoxious music while someone lies to me about how important I am to them. I know I need the information I might get if I wait long enough and I have it on my list and I do have time–I just keep forgetting! Nobody can make me make the phone call. I acknowledge my own power. I am in charge. My energy might be stuck or frozen in a past experience of waiting. I can use the Logosynthesis sentences to free my frozen energy. I acknowledge that I will do it–eventually–when certain conditions are met. Once those conditions of being damn good and ready have been met, I will make the call. Or maybe I will find another way to get the information I need. Sometimes all I need to do to release my energy is acknowledge my ambivalence. Sometimes I need more. Try this and see how the process works for you. 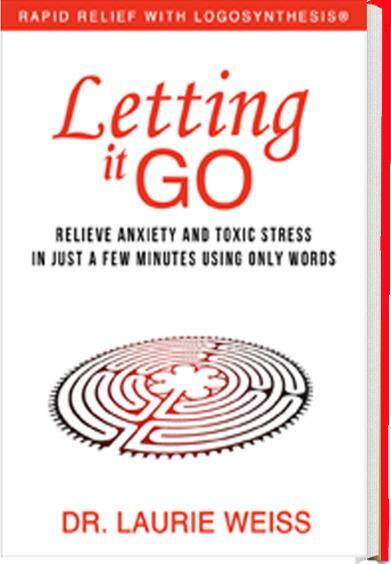 This paragraph is a comment I wrote about a passage on Page 49 of Letting It Go: Relieve Anxiety and Toxic Stress in Just a Few Minutes Using Only Words (Rapid Relief with Logosynthesis®.) You can see the passage in the book. You can also see the excerpt here. This link will take you to Bublish.com, where I regularly publish comments on parts of this book. This is a site where authors share of their work. You can subscribe to my musings, there, as well as to the musings of many other authors. It’s a great place to learn about new books and I recommend that you visit. What are you waiting for? We all make excuses for not trying something new, different and perhaps, a little uncomfortable. I am not leaving myself out of this. It is a favorite strategy of mine. I get all ready to do something but keep finding reasons to wait. Circumstances are not quite perfect. I don't have the exact right problem to use this on. For me, now, it's about making short videos. I will get past this and you can too. Once a friend and I spent months passing a "Just do it!" button back and forth. We were each doing a major project–mine was my PhD dissertation. Both projects were hard. We supported each other until the projects were complete–and she gave the button to someone else who needed it. 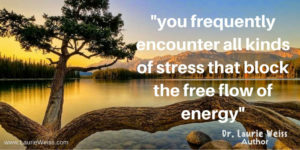 So, what kind of support do you need to make the small investment in yourself of learning to let go of stress by using the Logosynthesis sentences? 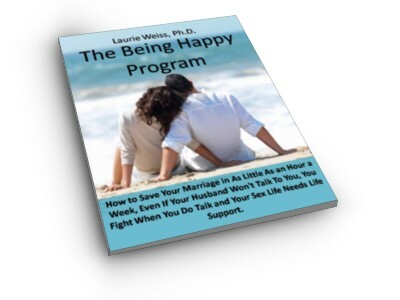 In the final chapter of this book, excerpted here, I offer tips to help you get started. No, you can't predict what will happen. Neither can I. But whatever you are facing is probably a memory of something you have already survived. If you run into trouble, contact me directly. I will help. 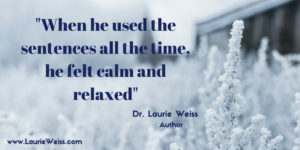 This paragraph is a comment I wrote about a passage on Page 115 of Letting It Go: Relieve Anxiety and Toxic Stress in Just a Few Minutes Using Only Words (Rapid Relief with Logosynthesis®.) You can see the passage in the book. You can also see the excerpt here. This link will take you to Bublish.com, where I regularly publish comments on parts of this book. This is a site where authors share of their work. 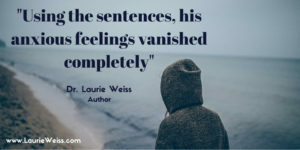 You can subscribe to my musings, there, as well as to the musings of many other authors. It’s a great place to learn about new books and I recommend that you visit.